The Atlantic cod is an interesting fish found in cold or cool water. It's very popular as food and is often used as the "fish" in fish and chips. Its white, flaky flesh has a mild and pleasant taste. 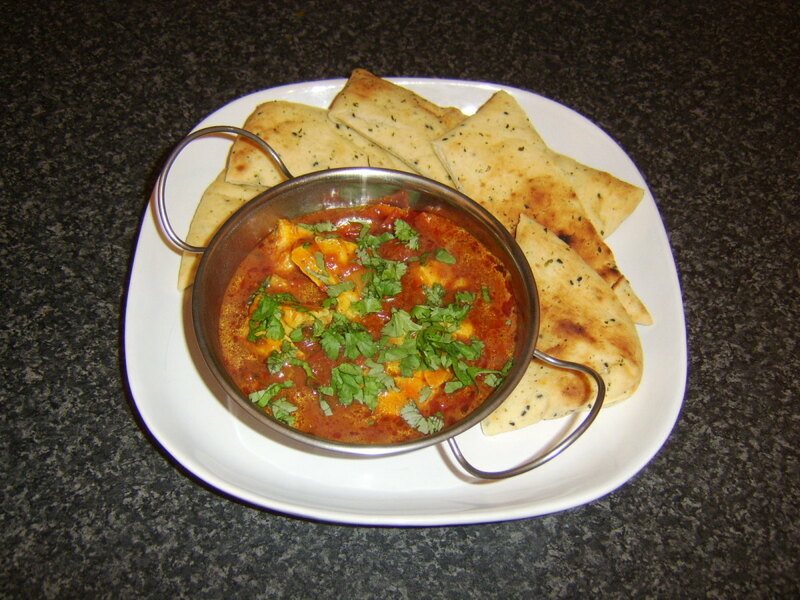 In some parts of the world, cod livers are used to make cod liver oil. The oil is very rich in vitamin A and is a good source of vitamin D and omega-3 fatty acids. Unfortunately, the popularity of Atlantic cod has led to a serious problem with some fish stocks. Cod belong to the genus Gadus. There are three species of cod—the Atlantic cod (Gadus morhua), the Pacific cod, and the Greenland cod. There are other fish which have the word "cod" in their name, but they don't belong to the genus Gadus. Hake are relatives of cod and are also cold water fish. They're used to make imitation crab meat and are often sold as frozen fish fillets. There are twelve species of hake. The Pacific hake (Merluccius productus) is also known as the Pacific whiting. Like cod, hake has white flesh, but it's softer and less flaky than cod flesh. The taste is mild and sweet. Unlike the Atlantic cod population, the Pacific hake is currently not in trouble. Both cod and hake belong to the order Gadiformes. They belong to different families within this order, however. The Pacific cod belongs to the family Gadidae and the Atlantic hake to the family Merlucciidae. The colour of the Atlantic cod is variable but is usually grey or olive. It may sometimes be yellow, brown, or reddish brown. The fish generally has a speckled appearance. The colour is darkest on the back of the fish and gradually fades along the side and belly. 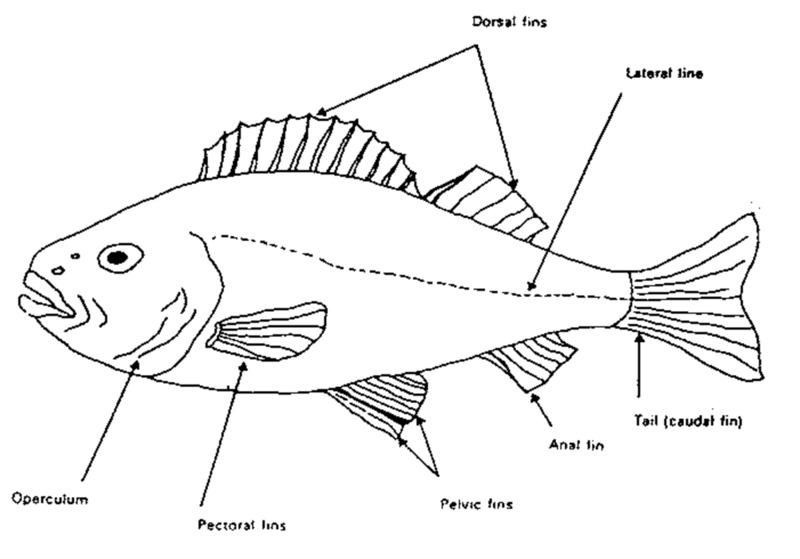 The light line along each side of a cod's body is called the lateral line. The line marks the location of a series of sense organs that detect low-frequency vibrations in the water. Cod also have a fleshy extension called a barbel on their chin. The barbel is a sensory organ that is especially sensitive to touch. 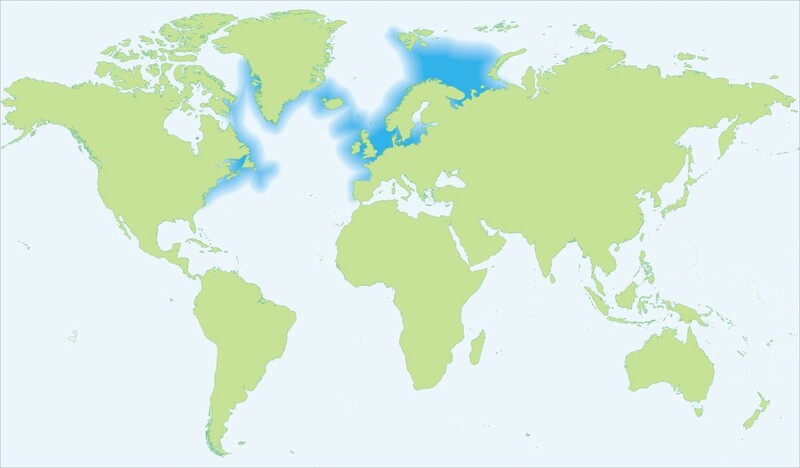 Atlantic cod live in cold and cool water on both sides of the North Atlantic Ocean. They have a protein in their blood that acts as an antifreeze. Different stocks of Atlantic cod sometimes have different characteristics and behaviours. There are some features that all cod have in common, however. For example, they all live in groups, or schools, and they are all predators. Cod are said to be "dermersal" fish, or groundfish, because they spend much of their time close to the ocean floor. Schools do swim through open water at times, though. Atlantic cod are most often found at water depths of four hundred feet or more. They feed on other fish, clams, crabs, mussels, lobsters, squid, shrimp, worms, and even juvenile cod. A school's diet depends on the prey that is available. Diet affects the colour of cod because the fish absorb pigments from their food. The pigments are believed to come from algae eaten by the cod's prey. Cod are generally reproductively mature between the ages of two and four. In the coldest parts of their range they may not be mature until they are six to eight years old, however. Spawning takes place at any time between January and October. The exact time of spawning depends on a school's location. A female produces a large number of eggs—from five hundred thousand to over a million. Despite this fact, only a few of the eggs produce new fish. 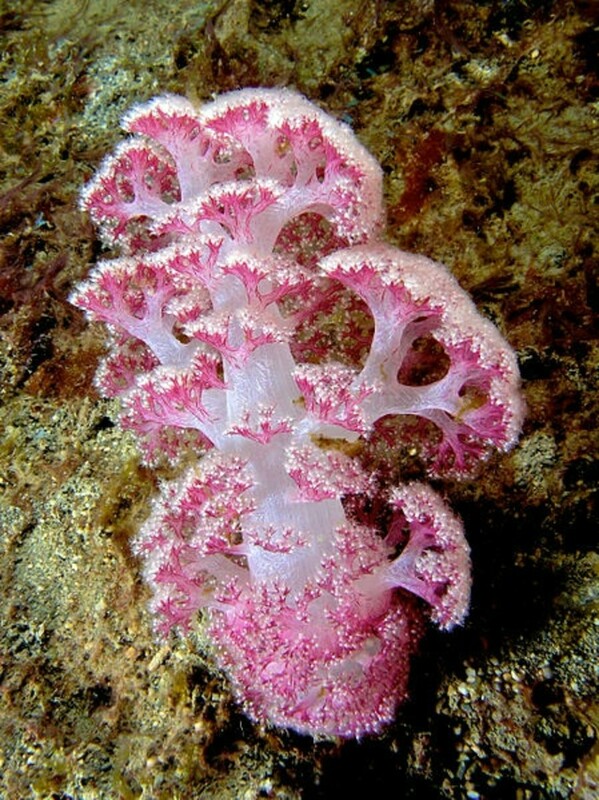 They are fertilized by the male's sperm as they sink to the ocean floor. The parents then leave the eggs to develop on their own. The eggs hatch into tiny larvae that drift with the plankton. Plankton is a collection of microscopic or very tiny organisms in the ocean. 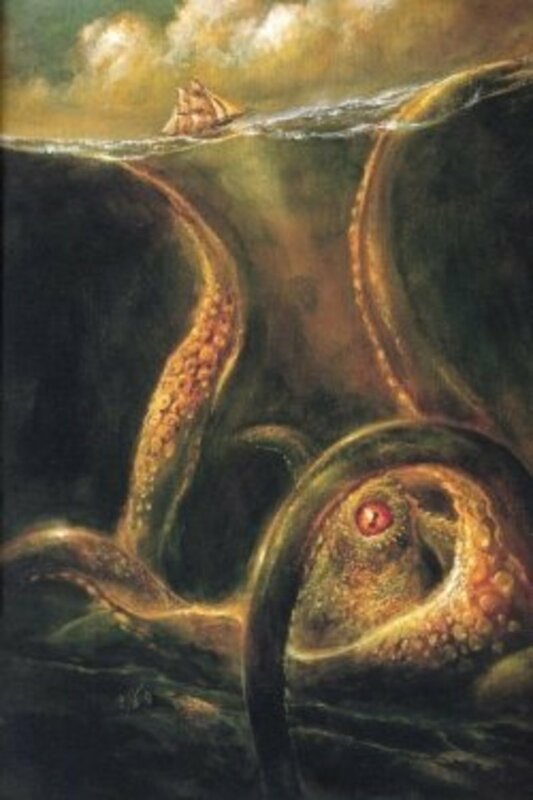 The organisms either can't swim or are very weak swimmers, so they are carried around by ocean currents. At first the cod larvae feed on the yolk in their yolk sac, but when this is gone they feed on plankton. After two to three months, the larvae settle on or near the ocean floor to continue their development. Atlantic cod have a maximum lifespan of about twenty-five years. Sadly, the Atlantic cod fisheries off the coast of eastern Canada and the northeastern states of the U.S. have been in a state of collapse for twenty years. Atlantic cod were once very abundant fish in these areas and supported the economies of many communities in eastern North America. When new "improved" fishing techniques appeared, such as sonar to find fish schools and massive nets to drag along the ocean bottom, the cod population fell dramatically and reached an unsustainable level. After twenty years of either a fishing moratorium or a severely limited fishery, the Atlantic cod population is showing signs of recovery in some places. This isn't the case in all parts of the cod's North American range, however. The Atlantic cod population in some parts of Europe is also in trouble. The North Sea is located on the east coast of Britain and is part of the Atlantic Ocean. New research suggests that the cod population in this area might be certified sustainable within five years after having been in a "disastrous" state. It would be good news indeed if this prediction applied to all of the North American cod stocks. A worrying situation has developed with respect to the Gulf of Main cod fishery. As in other places, the size of the cod population in the area has dropped very dramatically in recent times. Also as in other locations, fishing quotas have been applied to allow the cod population to recover. However, instead of showing signs of recovery, the cod population is still decreasing. There seems to be another factor at work in addition to overfishing. This factor is believed to be climate change. According to a study reported by the AAAS (American Association for the Advancement of Science), between 2003 and 2014 the surface temperature of the ocean in the Gulf of Maine rose by a greater amount than anywhere else in the world. It's known that cod are very sensitive to temperature change. The researchers found that as the temperature went up, the number of fish reaching maturity decreased. They don't know why this happened, but they note that other researchers have shown that warmer temperatures kill the tiny organisms in the plankton that larval cod eat. The researchers say that stricter fishing quotas are needed in order to save the local cod. The cod situation around Newfoundland and Labrador in Canada has been serious for a long time. Unlike the case in the Gulf of Maine, however, the northern stock in Canada is building up again. While it isn't ready for sustainable fishing yet, it may be in a few years if the fish continue to recover. As one scientist says, however, there's no guarantee that this recovery will happen. The Pacific hake looks quite different from the Atlantic cod. The hake is more slender and has a silvery, metallic sheen on its body. It often has black speckles on its upper surface. It has the same fin arrangement as a cod, but it doesn't have a barbel. The fish lives in large schools in the northeast Pacific Ocean. The largest hake stock is the coastal one, which is found from Baja California to southern Alaska. Smaller stocks exist in major inlets, including the Strait of Georgia, Puget Sound, and the Gulf of California. Pacific hake perform a daily vertical migration. They feed near the surface during the night and then migrate to deeper water during the day. They travel in schools in midwater but are also observed resting on the ocean floor. The hake's diet consists mainly of fish and shrimp. The Pacific hake performs a seasonal migration in addition to a vertical one. In winter the coastal hake travel further south to spawn, which they do in deep water. In summer they migrate northwards. At this time of year they're found in shallower water over the continental shelf and upper continental slope. Like the Pacific cod, hake prefer cold water. The coastal stock of Pacific hake spawns from December to March. 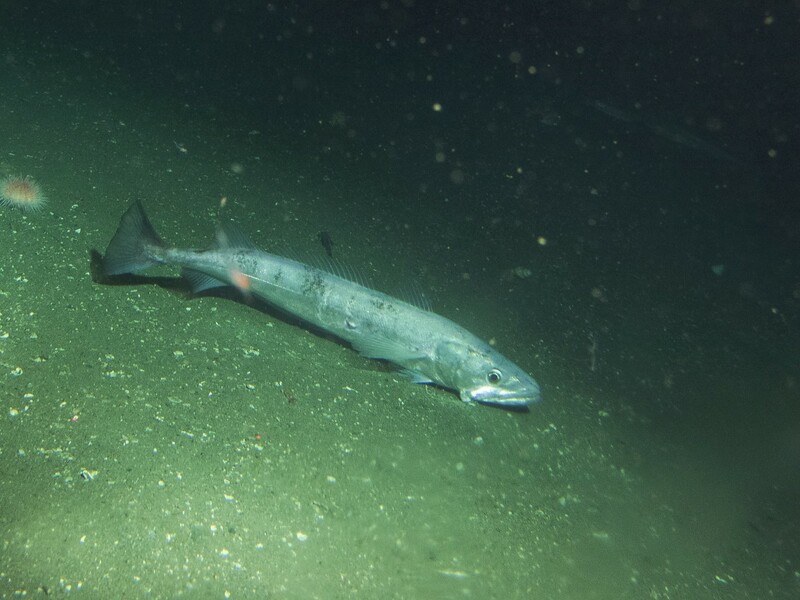 In the Strait of Georgia and Puget Sound, the time of spawning is moved forward to late winter and spring. Spawning may occur more than once during a season. The time required for the eggs to hatch into larvae depends on the water temperature. As in cod, the larvae at first feed on their yolk and then on plankton. 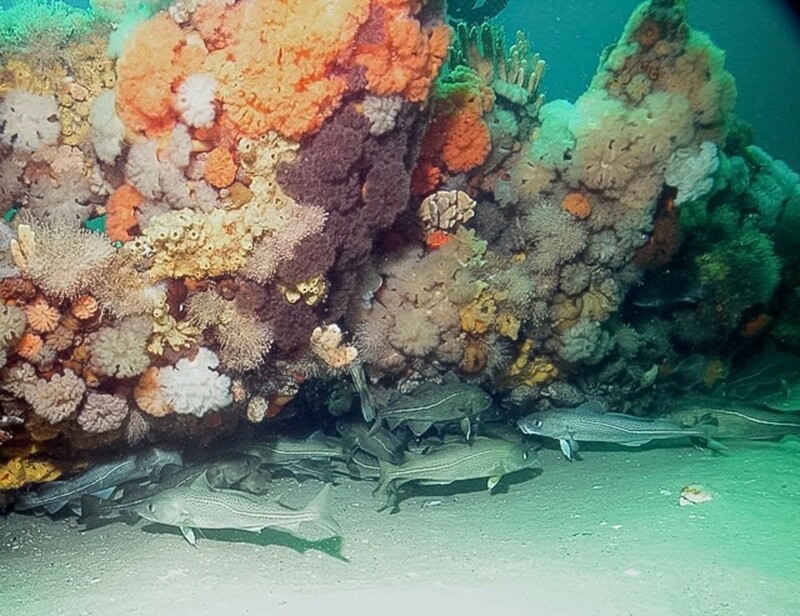 At some point in their growth, the young hake move to the ocean floor to continue their development. The flesh of both hake and cod is high in protein and low in fat. It's a great source of several vitamins and minerals, including vitamin B12 and selenium. The flesh also contains omega-3 fatty acids, which are believed to have important health benefits. These benefits include lowering the level of triglycerides in the blood and improving the health of the circulatory system. Hake must be frozen very soon after they're caught to preserve them. The market for frozen hake fillets is increasing and they're being sold in more stores. They are often breaded and sold as fish sticks or fish fingers. Pacific hake are frequently cooked and sold as a protein known as surimi. Surimi has the texture of a thick paste. It's shaped, artificially flavoured, and artificially coloured so that it resembles another type of seafood, such as crab meat. There are several organizations that classify fisheries as sustainable or non-sustainable. It's a good idea to check the websites of more than one of these organizations when looking for sustainable seafood. There have been criticisms that some classifications are wrong. Most commercial hake fishing is done by midwater trawls. Unlike the case in bottom trawling, a midwater trawl net isn't dragged along the ocean floor and is much less damaging to the environment. The back of the net has a mesh size that allows small fish to escape, thereby reducing the bycatch of unintended species. In addition, commercial hake fishing isn't allowed in areas occupied by large numbers of salmon. The Pacific hake fishery is being managed carefully and cooperatively in both the United States and Canada and is a sustainable industry at the moment. Have you eaten hake before? No, I'm certain that I've never eaten hake. Not that I'm aware of, but I may have eaten hake without realizing it. Yes, I have eaten hake, but I didn't like it. Yes, I've eaten hake, and I loved it! Biologically, the Atlantic cod and the Pacific hake are interesting fish. They are also valuable nutritionally. Hopefully, both the cod and the hake fisheries will become or remain sustainable. A continued and major effort is needed to help the Atlantic cod, however. I hope this effort is made. Thanks for the visit, Dianna. Cod is a nice fish to eat. It's popular, too. I love cod and eat it when I know it is fresh, it is so good! Interesting post on these fish. As always, I have enjoyed the read. Thank you for the visit and the comment, Peggy! I hope that the Atlantic cod population rebounds, too. The situation is sad at the moment. I hope that the Atlantic cod rebound and that fishermen use techniques going forward that do not endanger entire species of fish. Great article and informative videos as well. Thanks! Thank you very much, Maren Morgan! It's interesting to study cod and hake as living creatures instead of as a source of food. A lot of research here and the pix make these fish look like lovable pets. Super hub! you are more than welcome Alicia. keep up the great work. Cod fishcakes and fish chowder sound lovely, Deb. 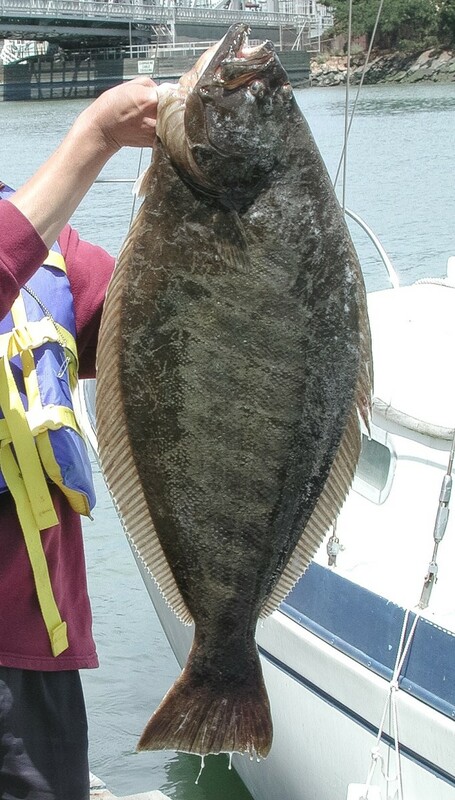 Hopefully the days when cod is common will return to Maine and the nearby states and provinces. I grew up on the Atlantic coast, and we used to buy Atlantic code fishcakes, which were some of the best fish that we liked having as kids. We also got hake, which was excellent, the skin peeled off easily. Both were used in fish chowder, which was very similar to corn chowder(with fish added!). Ah, those were the days on the coast of Maine. Thanks for the visit and the vote, torrilynn! Cod and hake are nutritious, and many people like their taste as well. I learned how nutritious they are and the fact that they are cold water fish. Thank you very much, Bill. I appreciate the comment, the vote and the share! The collapse of the cod fishery is a very sad story. If the cod stocks do recover they need to be managed very carefully so that the problem doesn't happen again. Very interesting Alicia. I did not realize the state of the Atlantic cod here in the Northeast. They need to find a way to make cod fishing sustainable. The Pacific Hake I had not heard of until now. Enjoyed the videos especially about the Atlantic Cod Fishing. Voted up, sharing, etc.. Great job. Hi, Eddy. Thanks for the visit and the comment! I hope your weekend is going well and is very enjoyable. Thank you for the comment and the vote, Prasetio. I'm looking forward to reading your new hub! SoIinteresting Alicia;Dai is a keen fisherman and I tag along but he fishes and I read or write. Wow...you have wonderful hub. I learn something new about "Northern Cold Water Fish". I have never heard about these fish before. Thanks for writing and share with us. Actually, my latest hub talking about fish tornado. You can visit my hub if you have time. VOTED UP! Thank you very much, drbj. I always appreciate your comments! Cod and hake are interesting fish to study. Gee, Alicia, the stuff I learn from your fascinating hubs. Did not know that hake is often used to make substitute crab meat. Who knew? Thanks for the education. Thanks for the votes and the share, Tom! I appreciate your visit. I hope you have a great weekend! Hi my friend great well written article on these great tasting fish, we can catch cod fish here where live. Well done ! Thanks for the visit, Bill. Cod and hake do taste good. I hope the fisheries remain healthy. I've caught a few of them in my day. Good tasting fish for sure.